Main features are: FIRST DRIVE: Nissan LEAF 30kWh - Larger battery, more range and improved infotainment system. TECHNOLOGY: Charge Points Explained in association with Rolec. 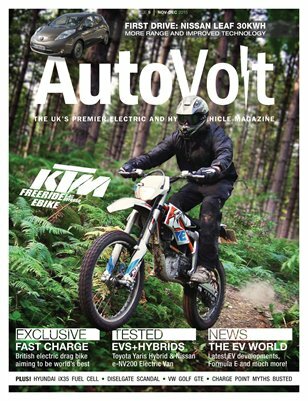 COVER FEATURE: KTM Freeride E-XC electric dirt bike review. FEATURE: Oh Dear Diesel - What happened and what may come from the ‘Dieselgate’ scandal. REVIEW: VW Golf GTE - A plug-in hybrid Volkswagen that is really rather good! REVIEW: Nissan e-NV200 Van - What’s the e-NV200 like as a purpose built electric van? FEATURE: Dewar & Simms Awards. FEATURE: Fast Charge EV drag bike - a ‘six second’ electric dragster. REVIEW: Toyota Yaris Hybrid - A supermini with a hybrid powertrain? FIRST DRIVE: Hyundai ix35 Fuel Cell – A fuel cell vehicle driven around London.